Silk Scarf Gray Black White Hand Painted Chiffon Shawl Silk Wrap SILVER NIGHT, by Silk Scarves Colorado. Select Your SIZE! Birthday Gift, Christmas Gift, Anniversary Gift. Bridesmaid Gift, Valentine Gift. Gift-Wrapped. Elegant Handmade Silk Scarf. Hand Dyed Silk. Handmade in Colorado, USA. 100% silk. 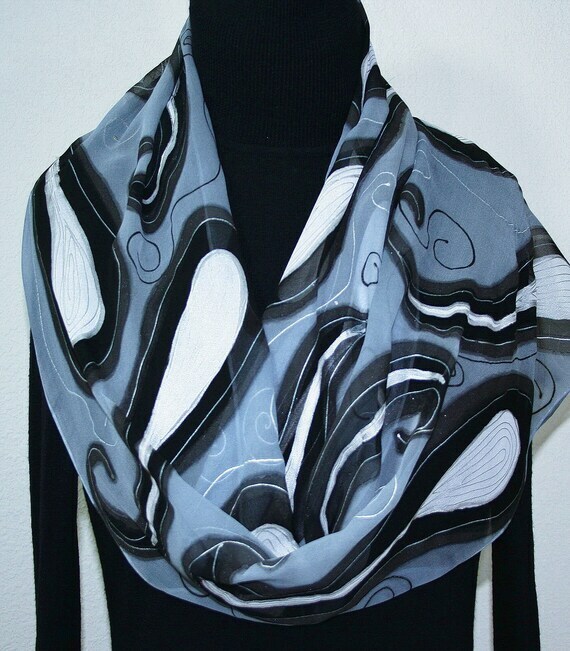 This is a 100% Chiffon silk scarf featuring shapes in white, outlined in black, on a background of silver grey. Decorated with thin accents in silver, black and white. NOTE: The wooden ring in some of the photos is not included.